At the last board meeting I moved to vote on the following three motions. Technically, you need to move for a vote before a discussion can take place. Though I couldn’t even garner a second, I’m hopeful the following motions will be adopted at a future date (though maybe not in their current forms). Each board member, following a 4-month grace period, shall create and maintain a personal list of district goals he wishes to see achieved during his term in office. Such lists shall be deemed public records. Aside from adopting these motions, I have three other goals for this school year. If you have additional goals you wish to see implemented, I encourage you to be heard. As for me, I trust my supporters and critics alike to hold me accountable. >>> Read more! Dr. O’Malley and Ms. Irons continue to undo some damaging prior practices. The changes are “buried” on Page 12 of last Monday’s BOE agenda. Extra Curricular Personnel – 9 Coaches are on Step 1 of the pay scale, up from only 2 coaches on the preliminary list (page 24). This is both a cost savings and a sign that turnover among the untenured coaching positions is higher than originally estimated. Sadly, we still have too few people applying for coaching positions but that is something we will have to address before next year. School Psychologist II – In 2007, the four highest paid school psychologists in Monmouth County were employed by the Matawan-Aberdeen Regional School District. The reason appears to be that our school psychologists are covered by the MRAA (administrators) contract rather than the MRTA (teachers) contract because the job description includes a supervisory role. That may be necessary in certain circumstances but not all school psychologists need to be supervisors. Dr. O’Malley has therefore created a new position, School Psychologist II, who will be paid according to the MRTA contract. Moving forward, the mix of supervisory and non-supervisory school psychologist positions will be determined on a needs basis. Director of Technology – The prior director of technology was a high school graduate. Dr. O’Malley has revised the job description to require a masters degree and a principal or administrator certificate. On the financial front, last March, the district received a $2.6 million capital grant from the state assuming we provide $3.9 million in matching funds. The grant needs to be accepted by the end of the upcoming school year. Expect to hear more about this next spring. More to be done but nice to know we’re moving in the right direction. >>> Read more! Patt Engle, Secretary at the High School, passed away Thursday, July 23rd. Highway 35, New Bedford Rd. When punching to the face, the trick is to aim for the back of the head, thereby delivering maximum force at the point of impact. By analogy, when preparing our students for college, we need to focus on college graduation, thereby ensuring they are maximally prepared upon entering college. I have three college related goals for our seniors – maximum choice, degree attainment, and minimum debt obligations. We can expand choice by improving academics and financial planning. We can improve the percentage of students who actually complete college by better preparing them for college. And we can help them avoid crushing debt through financial planning services. We need to look beyond high school graduation. Before continuing, let’s first review a cardinal rule in data study – correlation does not prove causation. For example, most great basketball players are tall. That doesn’t mean playing basketball will help you grow taller. By extension, there’s no proof that a college degree improves lifetime earnings, only that people with college degrees tend to earn more. Correlation often proves a relationship but it doesn’t define that relationship. It’s easy to see why tall basketball players have an advantage over shorter basketball players but the relationship between a college degree and lifetime earnings is less obvious. Certain high paying careers require advanced degrees but even people with just a bachelor’s degree out-earn their peers. Is it the college education or do colleges simply attract the type of person who is more likely to advance professionally? We don’t know. We have the same questions in education. There are strong correlations between advanced high school coursework and college graduation rates. We don’t know why. The courses may attract students that are more likely to complete college degrees. Students with challenging academic backgrounds may be more likely to attend colleges that offer better support services. Or maybe taking tough classes better prepares a student for the rigors of college. Will placing a student in an AP class improve his chances of graduating college? Will giving students a challenging math curriculum improve their chances of getting college degrees? We don’t know. We don’t have the data. All we know is that there is a correlation between academic achievement in high school and college graduation rates. First a story and then some data. Boston, Massachusetts is widely, deservedly, and proudly regarded as the city of higher education. Growing up in Boston, I remember my community taking great pride in academic excellence. In 2006, the Boston Higher Education Partnership commissioned a report showing that half of 2005’s graduating class from Boston public schools required remedial math their first year in college. Two years later, the city investigated college graduation rates. The results were shocking. Boston’s class of 2000 had 2,964 graduates. Of those, 64.2% enrolled in college, including both 4-year and 2-year institutions. After seven years, only 35.5% of the students who enrolled in college had completed ANY degree, whether a one-year certificate, an associate degree, or a bachelor's degree. Meanwhile, student loans are not dischargeable through bankruptcy or by failing to earn a degree. 7.7% of 4-year graduates accumulate over $40,000 of debt. Private student loan companies often charge 10% origination fees and 18% interest. (Federal loans are capped, hence the need for private lending.) New Jersey plans to reduce aid to career colleges by almost 40%. We don’t want our district’s graduates beginning adult life with crushing debt and poor job prospects. As in life, the best medicine is preventative care. These are minimums. In fact, students who reached this level of academic curriculum intensity accumulated much more than these threshold criteria (see table F1), and 95 percent of these students earned bachelor’s degrees (41 also percent earned master’s, first professional, or doctoral degrees) by December 2000. Our senior graduates represent the culmination of all our district’s efforts to prepare our children for adulthood. At the very least, our students should have the academic skills to pursue higher education at the schools of their choices and complete their degrees without being overburdened by debt. Which institutions of higher learning have accepted (not enrolled) our students? How many of our students have achieved the academic benchmarks indicating they would be statistically likely to receive a 4-year degree should they choose to enroll in college? Have our students and their parents/guardians received appropriate financial planning services? Most of us want our children to attend college and all of us want our children to have that choice. Let’s be sure they have the skills to finish what they start. >>> Read more! Daniel Cleary, MRHS Class of 2008, passed away on Monday, July 13th. We have no way to express our grief or our sympathies for his family. Daniel was loved by many and will be missed. God bless Daniel and his family. Counseling services will be available at Matawan-Aberdeen Regional High School for students and community members. Please call Mrs. Ruscavage at 732-705-5355 or Mr. Schweitzer at 732-705-4024 for more information or assistance. >>> Read more! In 1947, the Communists seized power in Poland and Hungary. Edwin Land introduced the first Polaroid instant camera. Jackie Robinson signed a contract with the Brooklyn Dodgers. Saab produced its first car. The United Nations voted to partition Palestine. Harry Truman created the Central Intelligence Agency and the United States Air Force. Pakistan and India gained independence. And Howard Lloyd began working in the Matawan-Aberdeen school district. Prior to teaching, Mr. Lloyd served with distinction in the Engineering Corps during World War II under generals Patton and Clark. As a teacher, he focused on the students' futures, teaching character, language, and history. He believed the students’ needs always took priority and objected to shortcuts that would shortchange a child. Over time, Mr. Lloyd instructed thousands of students. I don’t know how many remember what he taught but I doubt many forgot how he taught. Through the decades, Mr. Lloyd saw many teaching fads but maintained a simple approach – master the material, love the student, and see greatness in your pupil. After 61 years, Mr. Lloyd announced his retirement when he was unable to attend a high school graduation. Mr. Lloyd, thank you and best wishes. >>> Read more! Last year, Kim Honnick, former Assistant Superintendent of Curriculum, had her position eliminated, Pat Janover was appointed principal of Ravine Drive Elementary, and Jessie Zitarosa and Margaret De Luca were appointed Directors of Accountability. Dr. O’Malley has his team. Soon, he will have defined goals. Those goals will fall into three categories – educational, financial, and special projects. Within two weeks, I expect to post a draft compensation plan that will tie district goals to Dr. O’Malley’s compensation. I strongly believe that properly structured financial incentives improve performance. In the meantime, the goal garnering the most attention, due to the recent raises, is financial. For example, Mr. Rubin charges $160 per hour compared to his predecessor who was only charging $130 an hour. However, it would be wrong to assume that both individuals would charge the same number of hours given identical assignments or that they would provide the identical service. I firmly believe we will receive outstanding legal counsel and our legal costs will drop. In fact, I will give 10 to 1 odds to anyone who wishes to wager (proceeds going to charity) that legal costs will increase. There have also been concerns that Mr. Schweitzer’s experience as a state monitor ill-equips him for the position. Once again, I’ll wager that we have fewer complaints, fewer lawsuits, and fewer out-district placements. The focus needs to remain on goals. In West Point, the cadets are only allowed three responses during early training – “Yes, Sir”, “No, Sir”, “No Excuses, Sir”. This past year, we saw several initiatives, more public data, and no tax levy increase. Next year, we’ll be expecting more and hold Dr. O’Malley and the school board accountable. >>> Read more! The past six months have been interesting. Among Aberdeen’s six representatives on the school board, only one has served more than a term, in contrast to all of Matawan’s representatives. A majority of the board has advance degrees (2 doctorates, 2 law degrees, and one masters in engineering). The special ed community, long a victim of school politics and power plays, has a new director plus two board members who were formerly officers of the Parents of Special People. In town hall, discounting Councilman Tagliarini who will still be serving his first year in office by November’s election, none of the office holders are seeking re-election. If someone keeps the spotlight on the town council for another two years, the remaining three council members are unlikely to seek re-election as well. Simply put, it’s no longer fun to serve in Aberdeen Township. The people have awakened, they are watching, and they don’t like what they see. The big question, though, is whether all these changes mean anything. We can only hope. For the upcoming elections, I doubt there are a hundred people in town that can name all four Republican candidates. Granted, I’m sure they can’t name all four Democratic candidates either but the Democrats have deep coffers, a town newsletter, a bully pulpit, and a well organized campaign to physically bring voters to the polls. (Notice the pay-to-play ordinance still hasn’t been passed.) Plus, the Democratic ticket is led by Councilman Tagliarini and Jimmy Lauro, two people with long and distinguished histories of town service. I had been hoping the Republicans would launch a grass roots campaign and force both parties to define the issues and stake their positions. However, with only four months left to campaign, I’m still waiting for the Republicans to develop a platform. The Democrats don’t need a platform – they’ll keep doing what they’ve been doing for the past twelve years. Though I will not be taking a position in the upcoming campaign, I do hope we will not elect an all-Democratic council. Having one-party rule for over a decade is bad for any governing body; there needs to be a vocal opposition to keep the majority honest. As for Aberdeener.com, I had expected traffic to drop after my election since I would no longer be doing any investigative reporting but that’s not been the case. I guess the temptation to take out a sitting BOE member, not to mention payback, has proven too great. 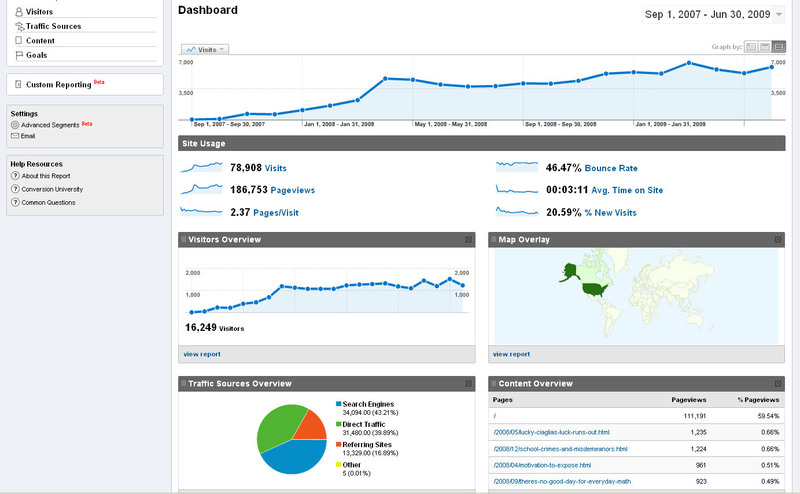 Last month, the blog had about 6,000 visits from 1,200 unique visitors with nearly 13,000 pageviews. That’s just a little over 10 pageviews per unique visitor. Since many people view the site from both work and home, the actual number is probably closer to 13 pageviews per unique visitor. Upon closer inspection, the numbers appear to reflect a lot of new visitors to the site who are going through the archives as well as people who keep returning to the site to post inflammatory comments. In other words, the very people who are attacking me are building the website’s audience. Perhaps I should thank them. For example, the article on raises for the top administrators had 191 comments, a record. Yet, that same article didn’t even make the top 30. How? Because the post comments page is on Blogger.com so it doesn’t appear on my traffic report. Apparently, large numbers of visitors simply went straight from the home page to posting a comment, bypassing the article itself. Of the top 5 articles in the past six months, 4 of them dealt with the election and filling the vacant seat and one was about Jawann Brown (whom we will continue to remember). Many of the comments are naturally from unaffiliated readers but other anonymous posters are fairly easy to identify; they’re the ones repeating talking points or just launching into personal attacks regardless of the discussion at hand. The logic is to either silence me by getting me to post fewer articles, discredit me by posting inflammatory comments, provoke me to say something inappropriate, undermine me by forcing me to censor comments, or to catch me saying something that violates my duties as a BOE member. Even if nothing happens, I’m sure they enjoy trashing me on my own blog. It’s like spectators throwing eggs at cars on the NASCAR Speedway – everybody loves a spectacular crash. 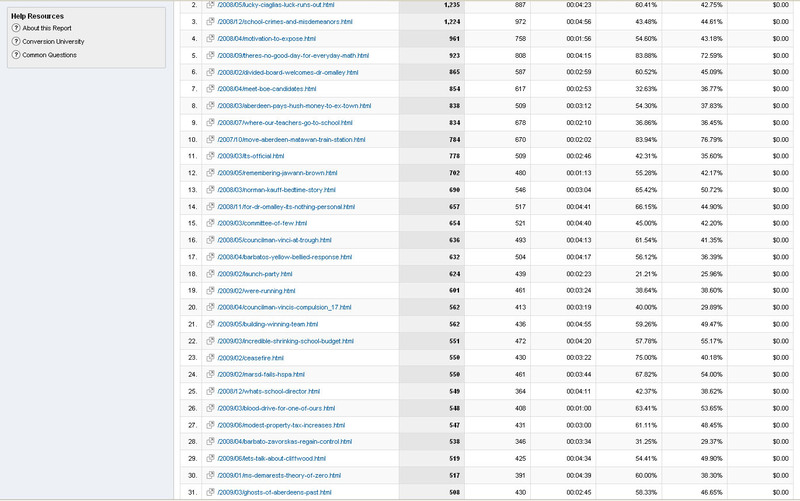 As long as my attackers keep building traffic to my blog, who am I to complain? On the contrary, now that I know more and more people involved in the school district read my blog, it’s become an even more effective communications tool to discuss and promote ideas for improving education. I look forward to competing for the hearts and minds of our teachers and parents. As a BOE member, I have only one objective – To focus our school district on educational goals that are open, reliable, commendable, and measurable. To those getting cheap thrills from anonymous attacks, I’m glad I can be of service. To everyone else who’s truly focused upon improving the lives of our residents, thank you for listening and I hope to hear from you as well. >>> Read more!